My grandfather sat on his jute weaved bed under a mango tree, an ice bucket full of mangoes underneath, a sharp rectangular knife in his hand. It was as if he waited for someone to arrive so he could serve them mangoes, from the tree that he sowed when no one lived in the town and the very first bricks of his house where being laid. I remember him running his knife through the mango's skin so neatly, there wasn't even a a mistakable bit of flesh left on it. He never let anyone stop at one, there would be seconds, thirds and fourth. When one would eat no longer, he would propose them to try another variety of mango that he had planted a few years ago. As we played around his garden, he would call and give us a thick chewy slice of a mango fruit leather as our 'candy'. As the lunch time rolled, grandmother would get our thali (food plate) to the bed - a simple meal of stir fried okra, roti and aam ras (sweetened mango pulp with a dash of milk or water). And despite our over dose of mangoes, we ate most of the roti in the aamras. Almost through his lunch, nanaji as we fondly called him would call out to grandma to get some aam ka acchar (mango pickle) for the last few bites of his roti. The pickle that's made from the raw green mangoes he plucks himself when his beloved tree begins to fruit, he would say with pride. A dark brown kernel that's collected from the inside of mango seeds, sun dried for weeks is then handed to us an aftermeal mouth freshener and digestion aid. A hard tasteless candy that you chewy into, but the cooling and refreshing effect is felt once you sip water after it. Those were a few hours at my maternal grandparents house during our summer vacations and be assured that if we lasted any longer, the raw mango drink called panna would follow and/or mango smoothies for our evening energy drink. If you thought Indians are obsessed with mangoes, you were damn right! Every year as the mango season arrives, I think back to my grandma's garden and how she religiously takes care of the mango tree that once was under the sole caring of my late grandfather. I was unfortunately too young to remember much about him, but the imagery of him under the cooling shade of that mango tree feeding us mangoes in one form or other is vividly coloured in my mind and I have a feeling that's how he wanted to be remembered. While I have worked with nut based tarts before, I was playing around with a gluten free version this time and I'm pretty impressed with this one. It holds it's shape, doesn't get soggy and is quite steady. I also just roll it out and cut into pretty shapes for my daughter to nibble at. I usually shy away from gelatine based desserts as they never impress as much as a 'real' custard but here eggs would really temper with the flavour of mangoes. 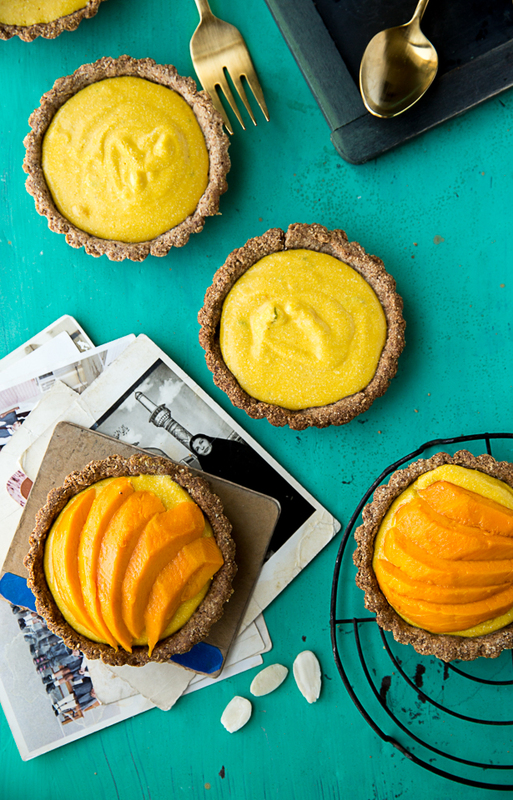 I use only a tsp which just about sets the filling and doesn't feel like a mango jello! But if you want something more set you might have to double the quantity. Also, while there is coconut in the base and the filling, this isn't coconut-y in your face which we don't mind. But if you are looking to add more coconut into the picture, add toasted coconut flakes on the top. 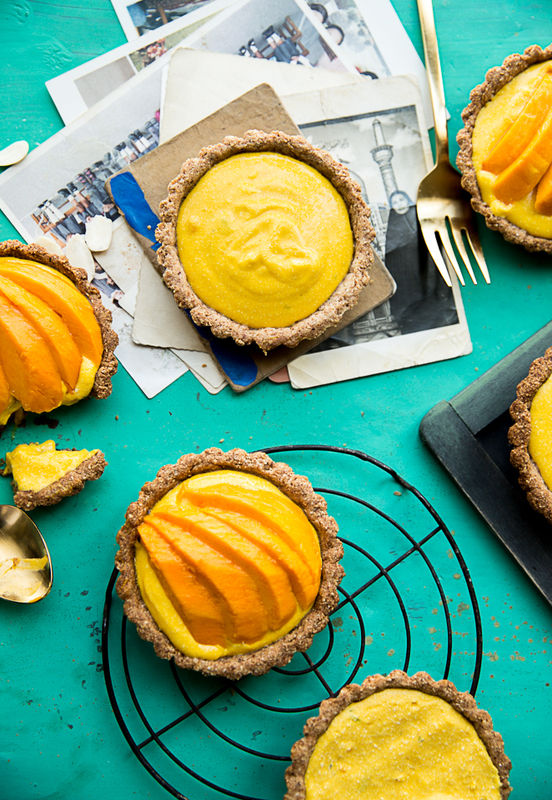 We have also tried an avocado mousse filling with this tart which I liked but didn't get thumbs up from my family! * I use freshly shredded coconut and store the remaining in the freezer using as required. In case you have only dry desiccated coconut, you might have to add a tbsp or so of water to form a dough. ** You want to have the sweetest mango possible here. Adjust the sweetness added based on the variety you use. I would say Alphonso mangoes are the best for this dessert. *** To get coconut cream, just freeze coconut milk for about half and hour. The fat solids get settled on the top while the liquid water will settle down. Quickly scrap off the top layer for coconut cream. Grease the 3 inch individual tart pans with ghee or oil, if necessary. For the crust, mix all the ingredients in a food processor and chill the dough for half an hour. Divide the dough into 8 equal parts. Make a ball of each part and roll it out on a parchment paper to 4 inch diameter approximately. Transfer to the individual tart pan and work up the edges. Do the same with the rest. 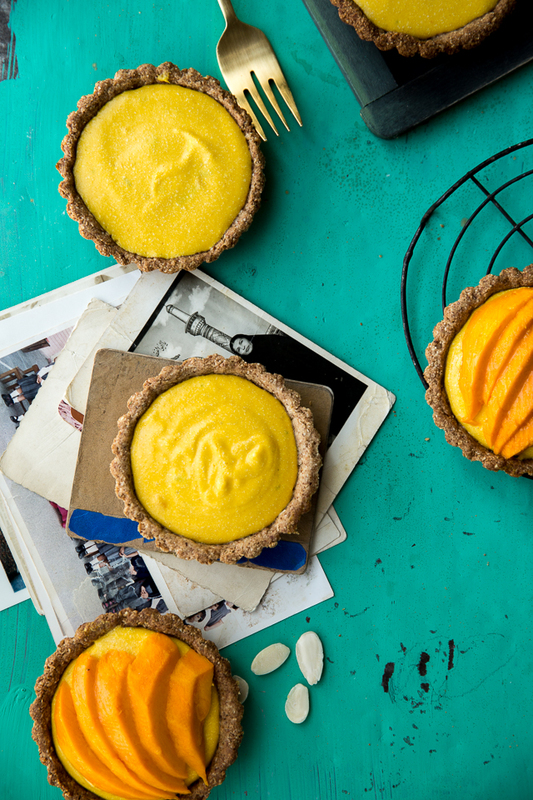 For best results, chill the tart shells in freezer for 10-15 minutes specially if you are working in a hot kitchen. 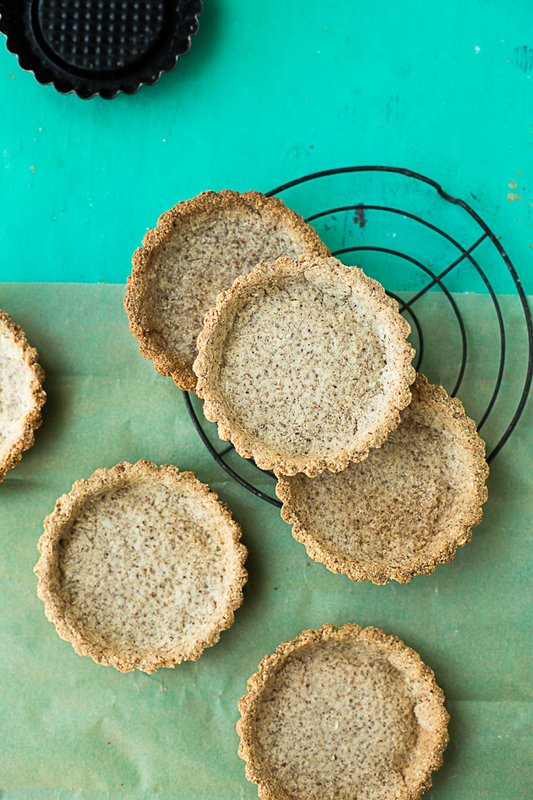 Fill the tart lined with parchment with dry beans or pie weight. Bake the tart in a preheated oven at 180 C for 20-25 minutes until the edges have lightly browned. Meanwhile, for the filling, puree the mango pulp, maple syrup, lime zest and cardamom. Remove 1/4 of the puree in a heatproof bowl and sprinkle the gelatin over it. Place the bowl over a pan of simmering water and whisk until the gelatine has completely dissolved. Mix it with the rest of the puree and keep aside. Whip the coconut cream until stiff peaks. Fold in the puree with a light hand. Place this bowl over icy cold water for an hour, stirring every now and then. It should have thickened after an hour. Spoon the filling into the prepared tarts. Chill for 5-7 hours atleast. Top with sliced mangoes before serving. Add toasted coconut, almonds or icing sugar if required. Lovely tartlets! They must taste divine. Beautiful tartlets and beautiful memories. Thank you so much. I looove the flavour of these! And they're super pretty too! Thank u for sharing this,and the story..so magical. Such a lovely recipe. Almond meal and fresh coconut sure sounds interesting. Loved reading through your story too! Beautiful photos, writing and recipe! I've only just discovered your blog and I can say your writing is endearing and your recipe delicious. Looking forward to wandering through past posts and recipes as I wait for your next update. Love recipes with stories, what a wonderful post. the crust is something that has immensely intrigued me. Lovely memories from your childhood. It is quite remarkable how much you recall from the past. I have very little memories from that far back. These are so colourful and beautiful! I love the story about your grandpa :) Mangoes are my favourite fruit so definitely saving this recipe. Your story reminds me of my Baba spreading the mangoes under the bed to make them ripen to the finest degree. He chose one or tow at a time and sliced them with great artistic skills. I eat at least one mango everyday in summer. Thank goodness I am not allergic to gluten, I devour everything WITH gluten in them. love little tartlets and such bright colors. What beautiful memories.,,, And these tarlets look wonderful! You know this is just my kind of dessert and your words and photos are a beautiful accompaniment to it. Mango and coconut is such a win-win combination. Thank you for the inspiration -- this kind of tart is just what we need, what with the onset of a hot and dusty Delhi summer! This looks so good, especially since it's gluten free. Those of us with that issue appreciate recipes like this. I don't have cardamom pods but do have the seeds. About how much would I need to make this recipe?